For example, when you run a campaign to increase your page likes, you only care whether your ads are increasing the number of likes. But consider that the number of likes says nothing about your fans’ relevance to your business. For all you know, a substantial portion of fans could be fake—that’s definitely not the audience you’re going for. 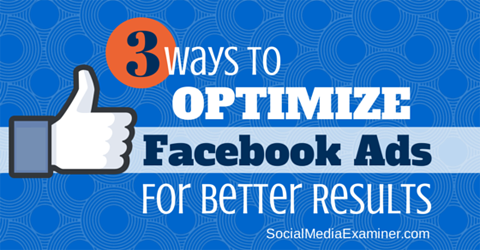 Find 3 ways to optimize your Facebook ads for better results. Whether you’re running a campaign to increase overall Facebook engagement, drive traffic to a website or convert website visitors, I assure you this issue still applies. So how can you optimize your Facebook ads to avoid that trap? Check your data to ensure you’re reaching the people most likely to buy from you. 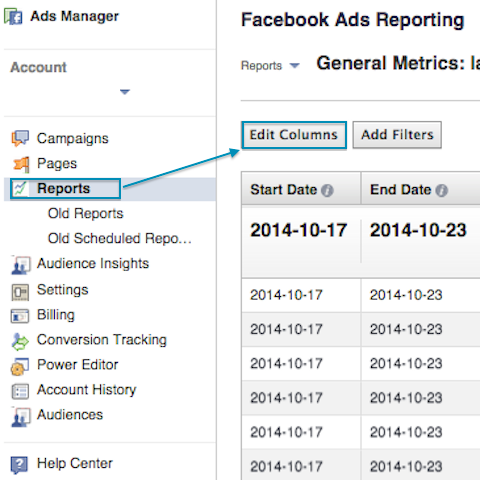 To see whether your current campaigns are working and truly reaching your target audience, go to your Facebook Ads Reporting page and click on Edit Columns. Open Edit Columns to start matching your Facebook audience with your current customers. Untick everything else and click Save Columns. Choose the data to view. You’ll end up with a table that looks like the one below. Click Reach on the top row to sort the table. Now you can see the demographics of the majority of people your ad is reaching and how much of your ad budget you spent on them. Sort your ad report table by reach. The key question to ask yourself is whether your campaigns are reaching the people who will convert. If they aren’t, look at your individual ad sets and make changes to or stop the ones that aren’t working. If you discover your current ads are reaching the wrong age group, change your demographic parameters in the Facebook ad settings. On the other hand, if you see that your conversions (e.g., video views in the table above) are higher for a different age group or gender, you may want to allocate more of your ad budget to that audience. 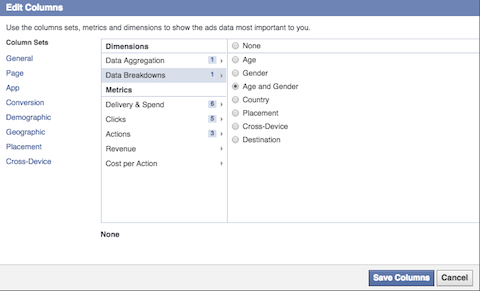 Ad report data breakdown options. 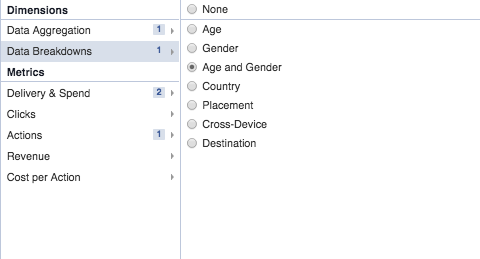 Just a quick note: Your Facebook ad report also tells you where most of your conversions are coming from—country, (ad) placement, device and destination (funnel). But beyond these options, there is little to no information on the exact category or type of Facebook users who are converting through your ad. This may come as a surprise, but I’m advising you not to create too many ad variants just yet. Don’t jump right into A/B testing. Designing good ad creative takes real time and effort, yet so many brands simply dive straight into testing and trashing different ad images without giving them a chance to shine. It’s a waste of resources and money. Before you do the same, try reusing an ad to see how the numbers differ. For example, I ran two duplicate ads for a client. Even though I ran both ads for the same period of time, the results differed in the total number of website clicks and cost per website click. Compare duplicate ad performance to see how they stack up. In the image below you can see that the click-through rates for both ads differ by more than 0.5% (neither click-through rate is ideal). The average optimized CPM for both ads also differs significantly. The first duplicate is 70% more expensive than the second. Take a look at the CTR and CPM for duplicate ads. You have no control over which ad performs better, but you can optimize your overall campaign performance by comparing data and getting rid of the ads that aren’t making the grade. Your ad creative can determine whether your campaign is a rousing success or a disappointing failure. Zach Kitschke, head of communications at Canva, suggests you pick imagery that tells a story about your brand or product. Adding an icon to your design immediately increases the salience of your message. No matter what, the visuals you use should be consistent—templates are great for this. And don’t forget the power of color. An emotive palette says a lot about your brand and should reflect your brand’s other marketing materials. Zach also told me it’s important to have a balanced design. Try using the rule of thirds: divide your design into three columns and three rows, then space out your content along those points. Use snackable images to convey your story. Donna Moritz of Socially Sorted likes to create “snackable” images that are easy for visitors to process and understand. Some examples of these snackable pictures are memes, quotes, behind-the-scenes photos, etc. Of course, your goal in using these quick images is to have people take action—whether it be a like, comment, share or click—so make sure you give your audience a reason to follow through. That may be via a call to action or an attractive image that leads to a related longer blog post. There are plenty of Facebook ad optimization resources online, but the most effective tips require you to look closely at your target audience, make sure you’re reaching those people and consider how you can best serve them. Don’t be afraid to make changes as necessary. When your data shows an ad isn’t reaching the right people, change it. Likewise, if your data shows success, don’t be too quick to modify it. What do you think? Have you tried any of these tactics? 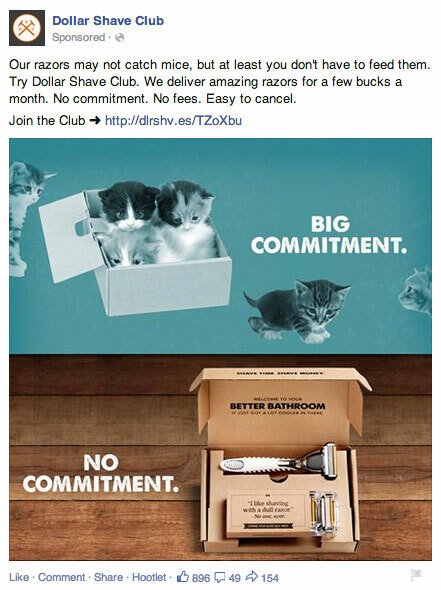 Did you see a change in your Facebook ad performance? Share your favorite tips for successful Facebook ads in the comments below. Jason manages over $1m in Facebook ad spend for satisfied clients in 3 continents. He calls bluffs in what “experts” say and craves lobster bisque pasta in Brussels.